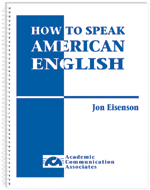 This volume includes descriptions of the consonant and vowel sounds of the English language, along with information about intonation patterns and the use of idiomatic expressions. Common problems encountered by speakers of Spanish, Vietnamese, German, Chinese, and other languages are included. Adolescents and Adults who are limited in their degree of literacy in reading and writing English. Elementary school students who are English language learners. Drills are included that emphasize vocabulary familiar to students in the elementary school grades. This is an excellent resources for accent reduction programs and programs designed to help individuals learn English as a second language (ESL).